FAQs: All Your Butter Chicken Questions Answered! Finally! All your burning questions about the Twosleevers butter chicken answered here! Everything from trouble shooting, substitutions, meal prep, questions about my audacity in creating such a simple Indian dish–everything you always wanted to know and more, answered in one handy-dandy FAQ. 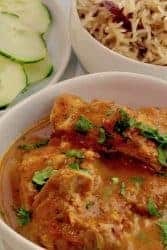 I hate when people praise their own cooking and recipes–but I’m going to break my own rule because this Low Carb Keto Instant Pot Indian Butter Chicken recipe is the bomb. This is my most popular recipe ever. Try it for yourself and you’ll see why! Stay in the loop with recipes, tips and techniques that allow you to nourish more but cook less.